Edison State’s Emily Powell reaches for a pass against Rio Grande Wednesday. Edison State’s Dakota Prichard drives towards the basket against Rio Grande. Edison State’s Clair Schmitmeyer goes up for two points. 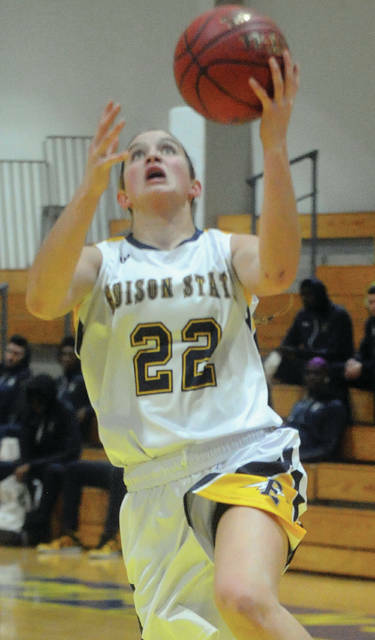 Edison State’s Lacey Watson hits a jumper Wednesday night. 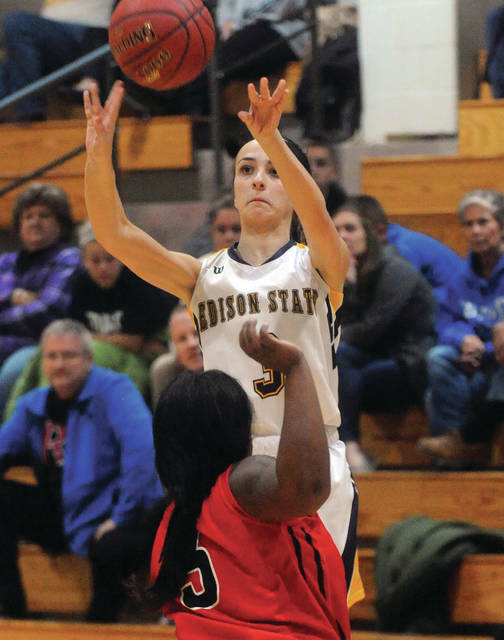 Edison State’s Marin Reis shoots a 3-pointer Wednesday. Edison State’s Caleb Maggard scores inside Wednesday. The Edison State basketball teams swept two games with Rio Grande JVs Wednesday. Both teams are now 4-1 and will host Wayne County on Saturday. The women’s game tips at 1 p.m., followed by the men’s game at 3 p.m. 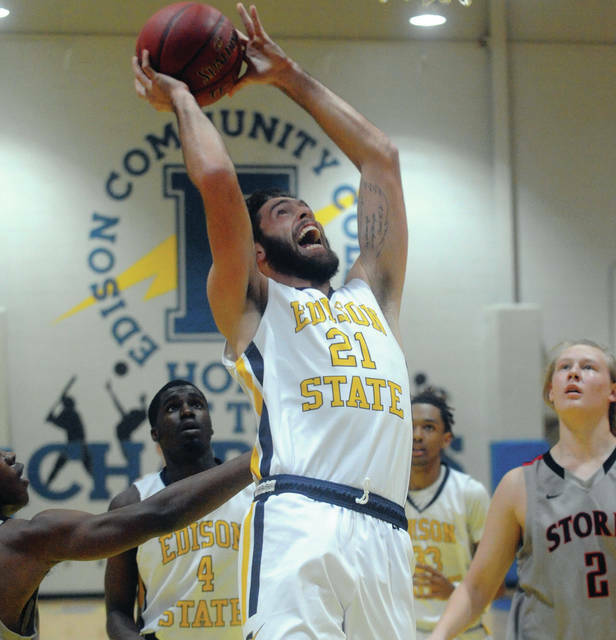 It was another big night from Lacey Watson as the men cruised to a 111-69 win over Rio Grande. Watson, who finished with 26 points, got 18 of those early to help Edison jump out to a 31-9 lead. He started the games scoring with a three, while Dakota Prichard and Lamine Komara followed with dunks and Prichard added a three to make it 10-3. That was followed by dunks by Komara and Watson and Watson hit a pair of threes to stretch the margin to 22-7. 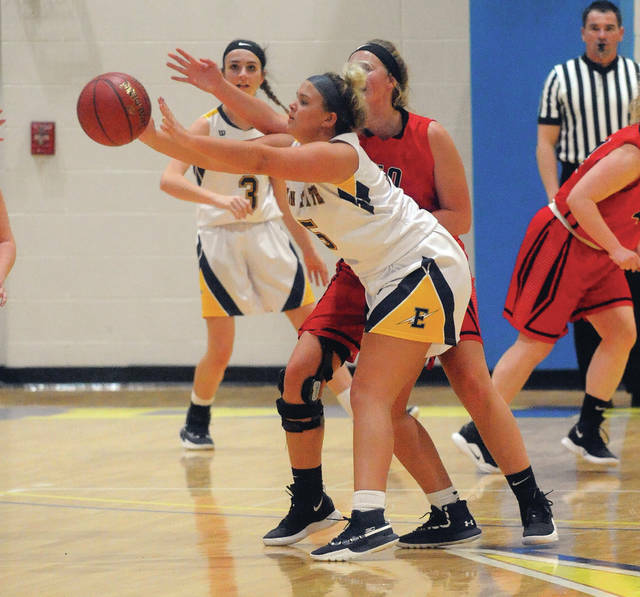 Jaedyn Carter scored four points, followed by five straight by Watson to make it 31-9 and the Chargers cruised from there, opening a 59-35 halftime lead. Watson finished 11 of 16 from the floor and three of seven from behind the arc and grabbed eight rebounds. Komara added 20 points on 10 of 12 shooting from the floor and added six rebounds and five assists. 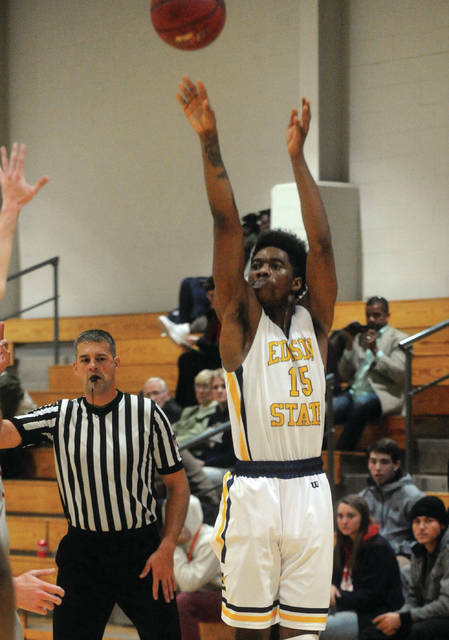 Sean Jones pulled down 15 rebounds, while Prichard filled out the stat sheet with 12 points, eight rebounds, seven assists and four steals. Carter scored 14 points, hitting all six of his shots from the floor, including two 3-pointers. 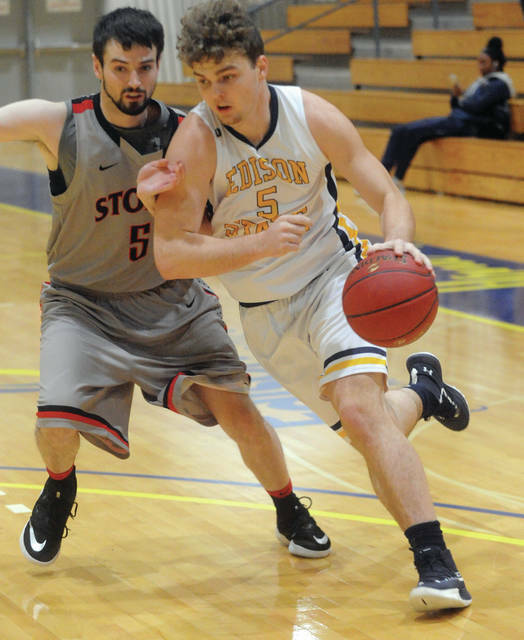 Nevin Wright had 11 points and eight rebounds, Malot Dushaj scored 10 points and Cameron Arnold dished out four assists. Edison was 47 of 89 from the floor for 53 percent, including 10 of 34 from behind the arc for 29 percent. The Chargers made seven of nine free throws for 78 percent. Rio Grande was 25 of 75 from the floor for 33 percent, including 11 of 40 from 3-point range for 28 percent. The Red Storm made eight of 15 free throws for 53 percent. Edison won the battle of the boards 64-34 and had turnovers to Rio Grande’s 15. Edison women had an easy time of it as well. Clair Schmitmeyer got her double-double off to a fast start with an offensive rebound and putback for the first two points of the game. A basket by Lauryn Gray and two by Sarah Pothast made it 8-0 in the early going. Rio Grande got as close as 12-6, before Edison scored the final 17 points of the quarter. Rebekah New and Schmitmeyer had four points each in the run, Kennedie Reese, Marin Reis and Pothast each scored two and Elysabette Andrews hit a three at the first quarter buzzer to make it 29-6. Edison increased the lead to 49-16 at half and 69-23 after three quarters. Schmitmeyer filled out the stat sheet with 18 points, 10 rebounds, four assists and three steals. New had 12 points and Brogan McIver added 10. Pothast and Reese both had nine points and seven rebounds and Reis grabbed five rebounds. Edison was 36 of 82 from the floor for 44 percent, including five of 17 from 3-point range for 29 percent. The Chargers made 14 of 24 free throws for 58 percent. Rio Grande made 14 of 54 shots for 26 percent, missing all 19 attempts from behind the arc. The Red Storm made 14 of 23 free throws for 61 percent. Edison won the battle of the boards 59-35 and had nine turnovers to Rio Grande’s 22.